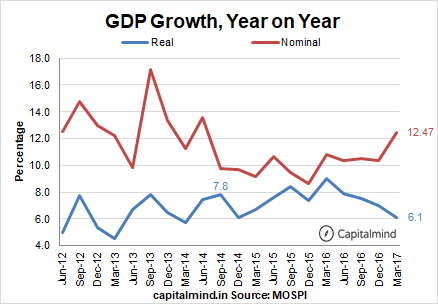 India’s GDP grew 6.1% on an inflation adjusted basis in Q4. This is the lowest number since March 2014. From a sector perspective, nearly everything except for government based services which is classified below as a personal service sector. But Manufacturing was a mere 5.2%, and Financial Services, just 2.2%. The worst hit was construction – which, due to inflation, contracted. It’s impossible to deny that 32% growth element. All from Government spending. And let’s not blame international slowdowns. Both imports and exports were up in double digits! Inventories are down, meaning people aren’t building stuff to sell tomorrow. Investments have contracted, after four up-quarters. That means there’s no new fixed capital formation either. 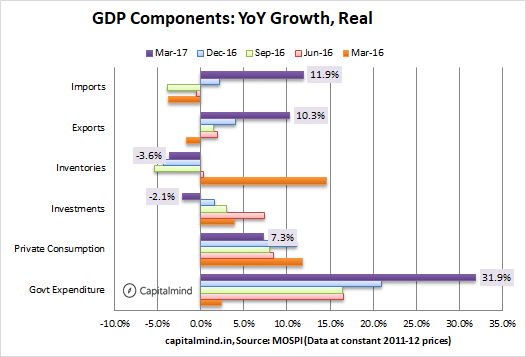 Private consumption grew just 7.3% and it’s the biggest element in the basket (about 57% of the GDP is pvt consumption). Who cares? The market doesn’t. It still wants to go up, and many stocks did even today. This is a bit of a patch but it’s not as bad as one would have thought. Reports on the ground are fairly miserable. There is a slowdown in manufacturing. There’s a slowdown in consumption. But in general it’s not as bad as we thought it might have been. Demonetization might have hurt much more, and it simply has not. You might wonder if the statistics have been fudged – and in some way they will always be, what with insufficient information and all – but that is all we have for now. In the days ahead, GST will bring lots of confusion with it. The US Fed could hike rates. The RBI might cut. In this structure, there continues to be strong investments from both domestic and foreign investors. 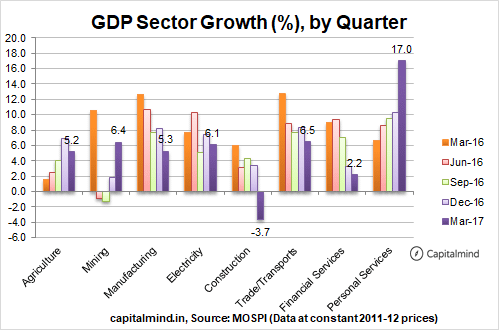 Financial sector growth may be slow but the financial markets are in great health. Slowing growth won’t matter to markets (until it does) and you might want to ignore that as a reason to sell. However, it’s important to understand that we’re running on fumes and a promise of a great future, and even after a few years, that great future hasn’t yet come about. By the next GDP release, expectations might be even higher and at some point, they will demand performance.